A Warm Orcadian Welcome awaits you from the Ross family at our recently built luxury lodges on our working farm. Experience life on a real working farm whilst relaxing in our beautiful, peaceful surroundings. It's all about LOCATION, LOCATION, LOCATION and Lenahowe Lodges are located in a safe, quiet and peaceful spot with spectacular views over the Harray Loch and the West mainland, making it an ideal place to unwind and relax. Whatever your requirements are we cater for them whether it's a Family Holiday, a Quiet Romantic Retreat, a Fishing Break, a Shooting Party, a Walking Holiday or Bird Watching we are ideally situated to provide for them all. 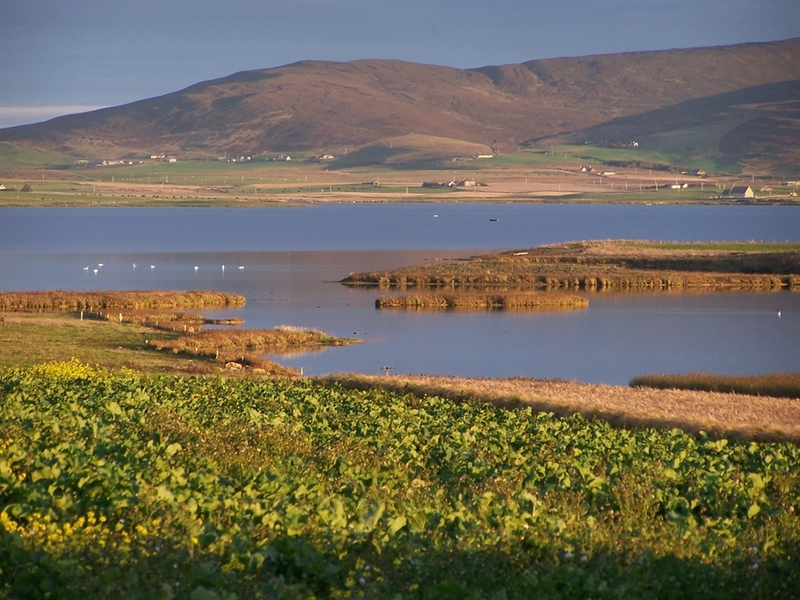 Lenahowe Lodges are situated in the heart of the Orkney West mainland on the edge of the Harray Loch. Orkneys famous historical sites of Skara Brae, Maeshowe and the Ring of Brogar to name a few are all close by with Dounby 5 miles, Stromness 7 miles and Kirkwall 16 miles all offering shops and hotels. FAMILY HOLIDAY- There is a safe garden area for children to play, a garage with a pool table, toys, books and games and also where bikes can be stored. As we are on a working farm with cows, sheep and chickens there is always something exciting for everyone to see, maybe even lambs to be fed!. There is a well equipped Utility room with washing machine and tumble drier and a separate drying room where you can dry off wet clothes and boots after an exciting day's activity. QUIET ROMANTIC RETREAT - The lodges are situated in a private, rural location with stunning views, there is a double ended bath in the bathroom and a luxurious bed with crisp bed linen and fluffy dressing gowns. The only onlookers you are likely to experience will be the four legged variety. FISHING BREAK- Lenahowe Lodges are situated on a working farm, where we farm 250 acres of land, giving us approx 2 miles of Loch shore on the Harray loch, which our guests have access to. The Harray Loch has 1500 acres of prime fishing water, with islands, skerries and bays, producing fish all through the season. No fishing licence is necessary so it can be enjoyed by all. The lodges are equipped with a rod/ drying room and a utility room to clean and gut your fish as well as ample fridge and freezer space to store your catch. A ghille is available if you require one. SHOOTING PARTY- As the Lodges are on a working farm we also offer shooting packages for the winter months, again we have 250 acres offering ideal shooting for wild Geese and ducks. As described above the lodges have facilities to clean your fowl, we also have dog kennels in a heated garage and locked secure gun cabinets. WALKING AND BIRDWATCHING - The Lodges are situated in farm land that is abundant with birds as well as being on the loch shore which is a rich habitat for birds. Within a few miles is the famous sea cliffs of Yesnaby and the Brough of Birsay which are only a couple of the rich breeding grounds for seabirds, including Puffins, in Orkney. The Orkney Islands has many beautiful walks and there are guide books in the lodges to help you find and choose the ones you wish to do.